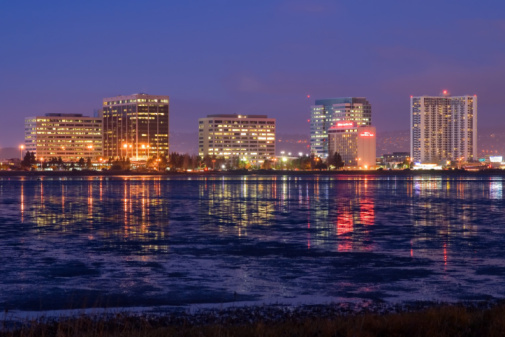 Running 2 square miles, between Berkeley and Oakland, directly opposite the Golden Gate and the San Francisco Bay is the city of Emeryville. Once a series of mudflats used to harvest clams and oysters and populated with oak trees, the original residents disposed of their shells and acorns in a single place creating the famous Emeryville Shellmound, which is now the site of the Bay Street Shopping Center. Emeryville is involved in ongoing reclamation of the Mudflats habitat due to the areas time as an industrial hub. It was named after a Gold Rush settler and Railroad kingpin, Joseph Stickney Emery, who owned large land tracts known as "Emery's". During the Depression the area had a shady history of gambling, speakeasies and racetracks. The Townhouse Restaurant, once a speakeasy, is an historic building throwing back to that era. The Watergate Marina, both a public and private marina is one of the last man-made marinas in the San Francisco East Bay. Housing consists of mostly newer, modern condos and townhomes and a few single family homes built in the 1920's. The Marketplace Redevelopment includes 674 residential units and parking. The population in Emeryville was 10,080 people (2010 Census) which makes it seem like a sleepy town of a reported 5,694 households, however it comes alive during the day with all of the regional employment. The Amtrak station serves to bus Amtrak riders to San Francisco. Emeryville is located near I-80 just north of I-889 and I-580 in the interchange known as the MacArthur Maze. Hwy 24 is accessible here. The Emery Unified School District serves Emeryville and parts of Oakland.